For my class on System Administration, I often use a homework assignment requiring students to capture and analyze tcpdump(1) output to help them understand how the DNS works in detail. This is accompanying the lecture notes, in which we do go through the packets from the server to the roots etc., but after grading the assignment, I often provide additional and repeated explanations to help students understand what they should have been able to get out of the assignment. This post serves as a sample solution that I hope is useful to others in understanding a little bit about both the DNS and tcpdump(1). That is, our query goes to m.root-servers.net, id 31286, with one additional RR section in the query ([1au]), asking for an A record for "www.yahoo.com". Our query is 54 bytes long, which is a bit larger than the 13 bytes needed for "www.yahoo.com", however. If you pass -v -v to tcpdump, you can get a little bit more information and you may find that our DNS server also adds an additional OPT pseudo-DNS record type, used to support EDNS. In particular, bind(8) uses an EDNS option code 65001 to send and process so-called "Source Identity Tokens", or DNS Cookies, which explains the larger query size. Note that the results show zero answer records, zero name server records, and one additional record (0/0/1) being returned. The *-|$ flags indicate that the authoritative answer bit was set (*) for IDs 27552 and 60312 (which cover queries for the root), but not for 64795 (which was the query for dlv.isc.org), nor for 31286 (which was for www.yahoo.com), recursion available was not set (-), the authenticated data (AD) bit was set for ID 27552 ($), and, notably, the truncated message (|) was set. length 117542475- q: A? www.yahoo.com. 0/15/27 ns: com. NS b.gtld-servers.net., com. NS g.gtld-servers.net., com. d.gtld-servers.net., com. NS j.gtld-servers.net., com. k.gtld-servers.net., com. NS c.gtld-servers.net., com. In other words: we asked the root server "Do you know what the IP address is for www.yahoo.com? ", and it replied "Nope, sorry, but seeing how you're looking for www.yahoo.com, here are the name servers responsible for .com. Oh, and since I'm guessing you will want to ask them next, why don't I go ahead and give you their IP addresses as well - here you go." The dig(1) output only shows 13 name server results (versus the 15 noted in the tcpdump output) because the tool does not show the DS and RRSIG records being returned when our server, which supports DNSSEC, queries it. To confirm, run tcpdump(1) while running dig(1); you should notice that the query does not have DO bit set in the OPT section, indicating no support for DNSSEC security RRs, and a result indicating 0/13/27. yahoo.com. 172800	IN	NS ns1.yahoo.com. yahoo.com. 172800	IN	NS ns5.yahoo.com. yahoo.com. 172800	IN	NS ns2.yahoo.com. yahoo.com. 172800	IN	NS ns3.yahoo.com. yahoo.com. 172800	IN	NS ns4.yahoo.com. www.yahoo.com. 1800	IN	CNAME atsv2-fp.wg1.b.yahoo.com. wg1.b.yahoo.com. 172800	IN	NS yf1.yahoo.com. wg1.b.yahoo.com. 172800	IN	NS yf3.a1.b.yahoo.net. wg1.b.yahoo.com. 172800	IN	NS yf4.a1.b.yahoo.net. wg1.b.yahoo.com. 172800	IN	NS yf2.yahoo.com.
.      503084  IN  NS  j.root-servers.net.
.      503084  IN  NS  e.root-servers.net.
.      503084  IN  NS  a.root-servers.net.
.      503084  IN  NS  g.root-servers.net.
.      503084  IN  NS  h.root-servers.net.
.      503084  IN  NS  c.root-servers.net.
.      503084  IN  NS  i.root-servers.net.
.      503084  IN  NS  f.root-servers.net.
.      503084  IN  NS  b.root-servers.net.
.      503084  IN  NS  m.root-servers.net.
.      503084  IN  NS  l.root-servers.net.
.      503084  IN  NS  k.root-servers.net.
.      503084  IN  NS  d.root-servers.net. edu. 172800  IN  NS  a.edu-servers.net. edu. 172800  IN  NS  c.edu-servers.net. edu. 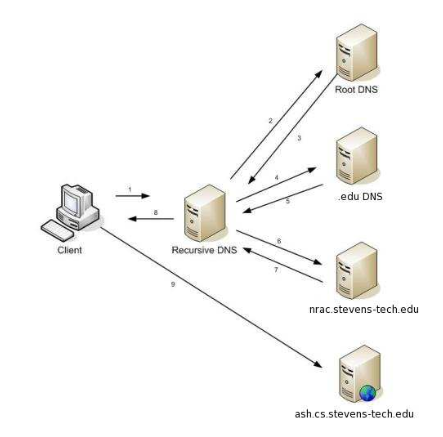 172800  IN  NS  d.edu-servers.net. edu. 172800  IN  NS  f.edu-servers.net. edu. 172800  IN  NS  g.edu-servers.net. edu. 172800  IN  NS  l.edu-servers.net. stevens-tech.edu. 172800  IN  NS  nrac.stevens-tech.edu. stevens-tech.edu. 172800  IN  NS  sitult.stevens-tech.edu. stevens-tech.edu. 172800  IN  NS  drdns2.stevens.edu. cs.stevens-tech.edu. 3600  IN  NS  sitult.stevens-tech.edu. cs.stevens-tech.edu. 3600  IN  NS  nrac.stevens-tech.edu. cs.stevens-tech.edu. 3600  IN  NS  drdns2.stevens.edu. 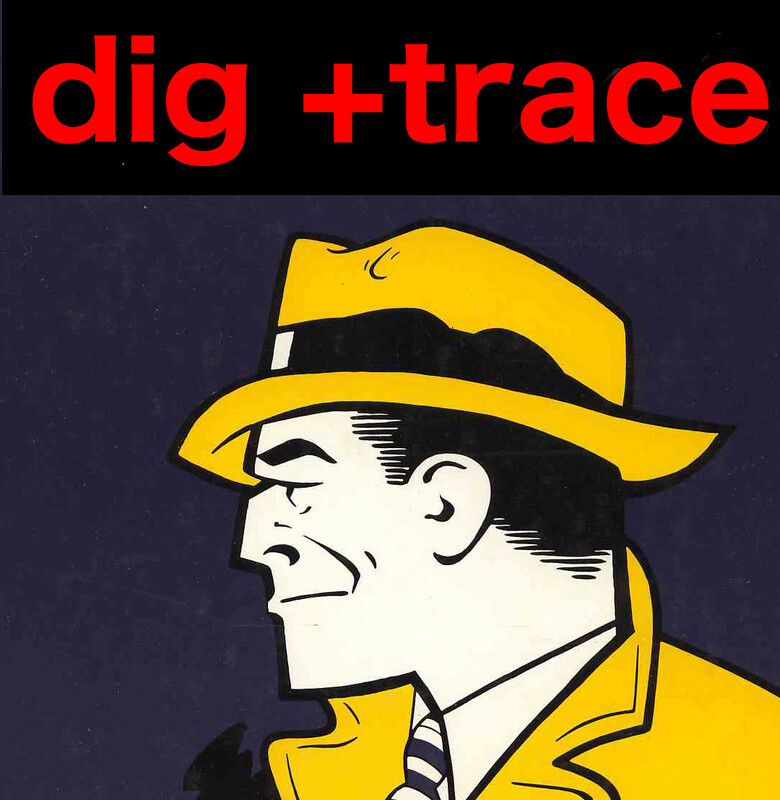 $ dig @98.138.11.157 -t A atsv2-fp.wg1.b.yahoo.com. That is, ns4.yahoo.com tells us which nameservers are responsible for wg1.b.yahoo.com., and... hey, wait a second! We already knew this information! That's exactly the information supplied by ns5-new.yahoo.com in the AUTHORITY section. Why didn't bind(8) use that information right away? Well, it turns out that CNAME records are special. The resolution algorithm defined in e.g. RFC1034 effectively says "if you encounter a CNAME that you didn't ask for, replace the original query with that result and restart", which appears to short circuit the processing of the AUTHORITY section, leading us to make one additional query to one of the authoritative name servers we had previously cached for yahoo.com. The responses from f.gtld-servers.net are again truncated, and we expect our DNS server to now switch to TCP to complete this query, but at this point we have interrupted the tcpdump process, as our initial command and query was successfully completed. Using e.g. 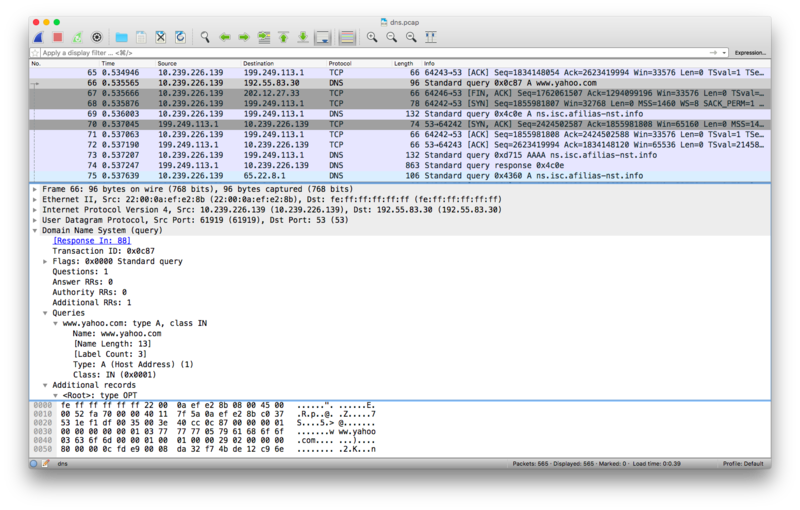 Wireshark to analyze the packets can be more efficient and convenient, but I do maintain that any SysAdmin worth their salt ought to be able to go through a pcap file just using tcpdump(1), and doing so is a useful exercise in tracing packets.